"I really like taco and burrito bowls and wanted to make something that was quick and easy at home. My husband and I really like how this turned out! Spoon into bowls and top with sour cream, crushed tortilla chips, lettuce, etc." Heat oil n a large skillet over medium-high heat. Cook and stir beef in the hot skillet until browned and crumbly, 5 to 10 minutes; drain and discard grease. Stir fajita seasoning into ground beef until evenly coated. Mix pinto beans, salsa, and brown rice into ground beef mixture; top with Mexican cheese blend. 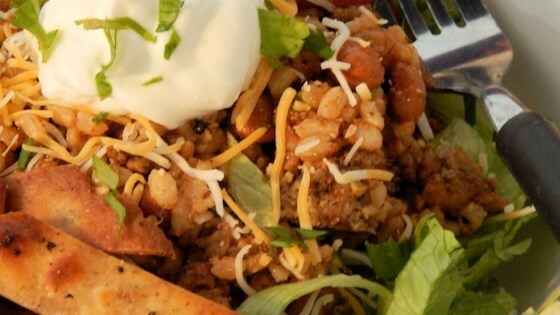 Try this Brown Rice Bean Burrito Bowl for lunch today. Love this dish! But to make it better add fresh cilantro, lime juice, and salt to the rice. I added green chilis to mine, and it turned out great! Definitely remember the salsa if not allergic to onions, etc in Salsa. I also added sour cream. Pretty good. It was very bland so I added more of the fajita seasoning and some diced green chilies; very easy to make and serve over lettuce as a salad. Added black olives to toppings. Yes, I will definitely make this recipe again.